Everyone wants to see Amsterdam by boat. Canal cruises are offered all over town and for €15-€20, a canal ride can be a great experience. But if you don’t have the €15-€20, or simply don’t want to be trapped like cattle on a canal boat, there is an option for you. 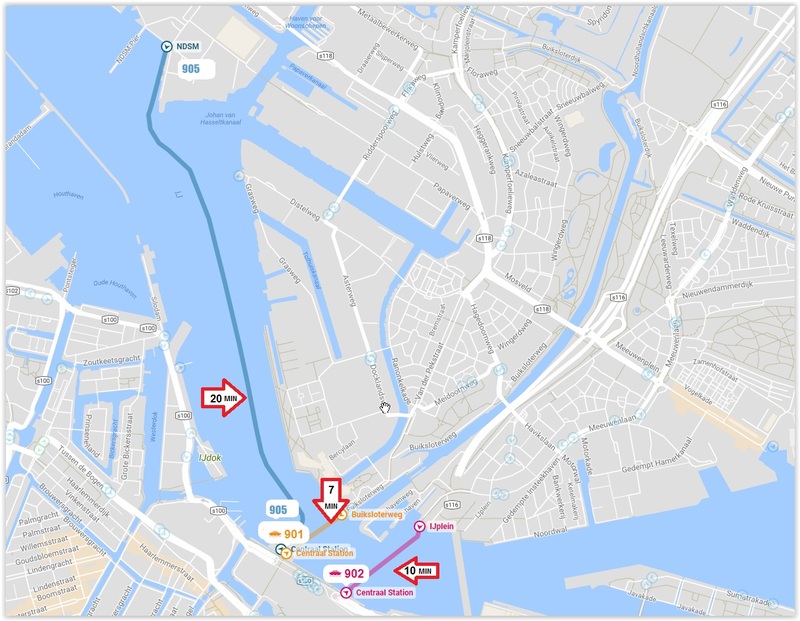 GVB offers FREE ferries rides across the IJ river. These ferries leave from the rear and side of Amsterdam Centraal station. You can see signs for them throughout centraal, just look for the boat symbol with IJ and follow the arrows to the docks. Amsterdam’s GVB ferries offer free connections across the River IJ for people, cyclists and mopeds(and spartamets!). If you have a micro 25mph car, you can even get that on a ferry! Most of the GVB ferries can be found at the rear or on the side of Amsterdam Centraal Station. The free GVB ferries offer frequent and free service across the water connecting Amsterdam to Amsterdam Noord. 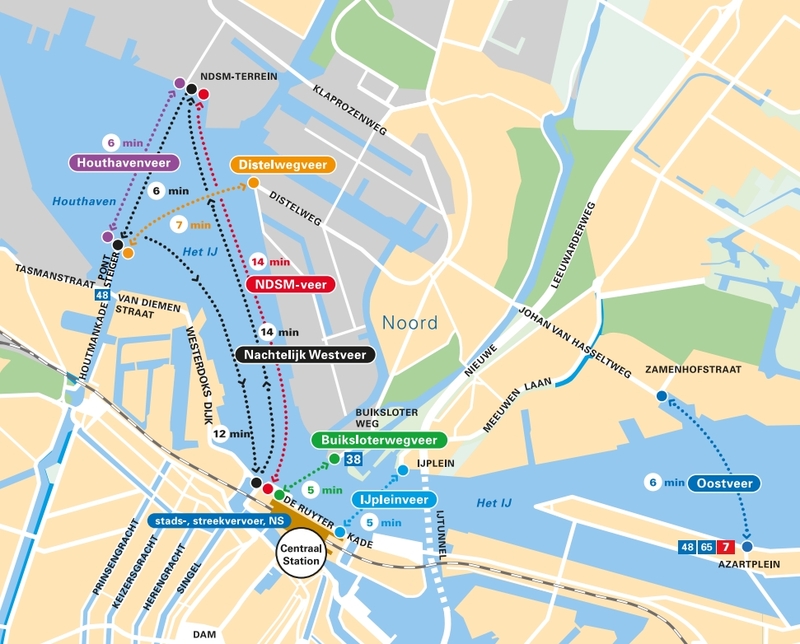 The most popular free ferry route is from Amsterdam Central Station to Buiksloterweg. This ferry is great forl for attractions such as the EYE Filmmuseum & Tolhuistuin. Numerous ferries serve this route so the wait is never more than 5-10 minutes. A clock displaying the destination and time until the next departure is shown above each dock. This route also has night service. The ride is quite short so getting picture from the ferry requires good positioning and a little planning. 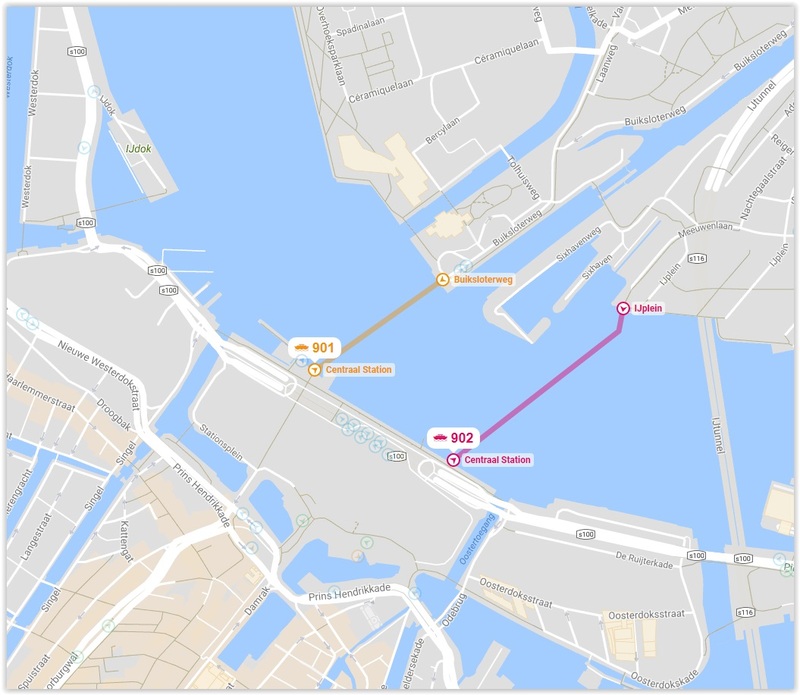 Ferry services across the IJ is FREE. You DO NOT need to buy a ticket before boarding. The free ferry to IJplein is a great option for a free ferry ride. It is only a few minutes longer than the quick 5 minute hop of the Buiksloterweg ferry, but since it head a bit more east, it offers some great Amsterdam skyline photograph opportunities. The ferry also has to make a turn in the water which allows people at the rear of the ferry near the loading ramp to get almost 360 degree photos from the water. As a bonus, on the IJplein ferry dock on the IJ island(not the dock for the ferry at the station) is one of the highest rated coffee cafe in all of Amsterdam call Al Ponte. Locals swear by the Italian coffee, sandwiches and little treats available here. This free ferry ride is recommended regardless of weather or time of year. The other main route served from Central Station is to NDSM Wharf. The wharf is home to many events, restaurants and creative companies. The ride is probably 15-20 minutes each way so take that into consideration. Not the most picturesque ride, but on a nice sunny day it’s a treat to take a nice free boat ride no matter where it goes. The GVB also offers ferry routes crossing the North Sea Canal from Amsterdam. North Sea Canal ferry services also transport motorized vehicles for a fee. When the ramp lowers, allow disembarking passengers off. Walk on to the ferry. Mind the small gap between the ferry ramp and the dock. To disembark, proceed to the rear of the ferry and use the ramp.